Whenever disaster strikes in the world, we can always count on the charitable hand of the gaming community to help those in need. Last month saw Nepal and surrounding regions struck by two massive earthquakes. The devastation left thousands dead and even more injured and without shelter or basic resources. The Eve Online community, as they always do, called on CCP Games to start another charity drive. And they did. Between May 1st and the 24th, players raised $103 thousand dollars, amounting to slightly less than seven thousand PLEX. The donation includes $500 from ISD volunteers as well as 365 PLEX from an auction. The check for the donation was presented, in large form, to the Icelandic Red Cross. Once again, here at CCP we are finding it very difficult to choose words that express our gratitude to the EVE Community for the incredible generosity you have all shown over the course of this fundraiser. The Community Team does however have an amazing display on the windows of our office as a constant reminder of the fact that we serve what is, without a doubt, the finest gaming community on Earth. 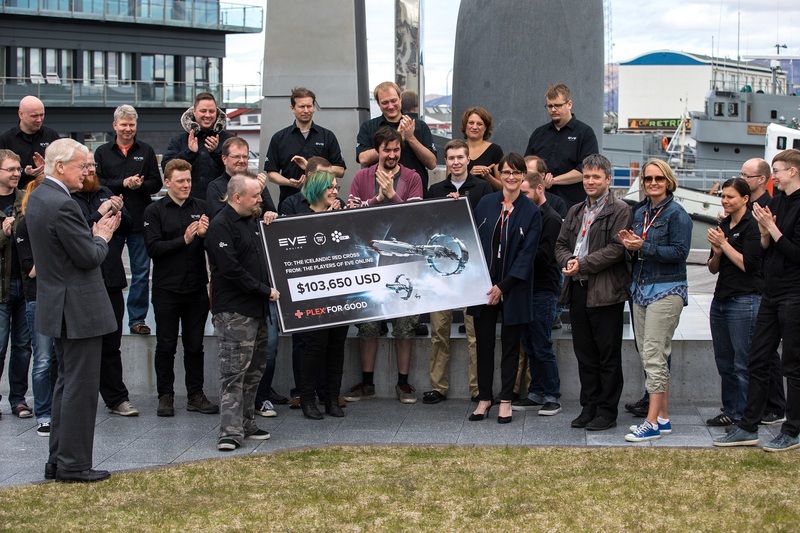 CCP and the Red Cross would like to thank the EVE community for its generosity.